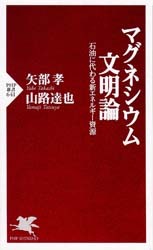 “Magnesium Bunmeiron (Magnesium Civilization)” (by YABE Takashi, YAMAJI Tatsuya) will be published from PHP-shinsho on Dec 16th. What is new energy that takes the place of fossil fuel? 60% of Japan’s land will be covered with solar cells if demand for energy in Japan is supplied just with them. Underground will be filled with Hydrogen tanks in Hydrogen society. There is not enough Lithium for EVs. Moreover, electric energy will have to be increased up to 150% of the present time to supply demand of water in the world by 2025. “Magnesium-based energy cycle” is a solution for these problems. Chapter 1: Can natural energy and Hydrogen take the place of Oil? Will oil disappear or not? Is there alternative new source of energy to oil? Is a solar-cell enough for electric energy requirements of Japan? Can sunlight be converted to laser? Why do we use chemical reaction? Where can we get Magnesium? What will Magnesium-based energy cycle change? How much carbon dioxide can be reduced with Magnesium? I think Solar is the way to go.. much cleaner and cheaper then anything else. Magnesium cycle is a way to use solar energy.